With today’s post, we’ve reached the 100th official episode of the Parlando Project, where we mix words from many sources (mainly poetry) with various kinds of music. For the 100th piece I’ve decided to feature an older recording of mine, almost 10 years old, of my performance of Robert Frost’s “The Oven Bird,” because it marks some of the initial ideas that lead me to this ongoing Parlando Project. Frost’s “The Oven Bird” is a devastatingly accomplished lyric poem written early in the 20th Century. The rhythm of the lines both grooves and varies itself, like the best music, and the rhyme scheme is elaborate, yet it never falls into forced rhyme. Frost’s language here is so plainspoken, ironically saving the fanciest and longest word for the poem’s last line. Frost is as rigorous a modernist as any of his contemporaries in the Imagist school. He’s as willing as any of them to hack away all the overused and overgrown 19th century “poetic language” and to use no word more than needed, but he does it here while writing a sonnet in rhymed metrical verse that sounds as natural as any free verse. Allow me to indulge for minute my musical interests for a moment. What Frost does here (and elsewhere) is like what John Coltrane did shortly before changing his focus to what was to be called “free jazz,” where melodic freedom was stressed by radically simplifying the underlying harmonic structure. Coltrane wrote and recorded the most devilish difficult set of rapid chord changes constantly shifting the harmonic center, an obstacle-course of a composition called “Giant Steps”, and then proceeded to improvise over it as if it was no matter to him to make those changes. Like Coltrane, Frost could seem free, natural, and innovative, while writing inside a constraining form. This sort of kindred accomplishment speaks to what attracts me in the Parlando Project to equally privileging music and words. “The Oven Bird” has a reputation as a downbeat poem, and while Frost will not sugar-coat the human condition, I did not, and still do not, find it so. 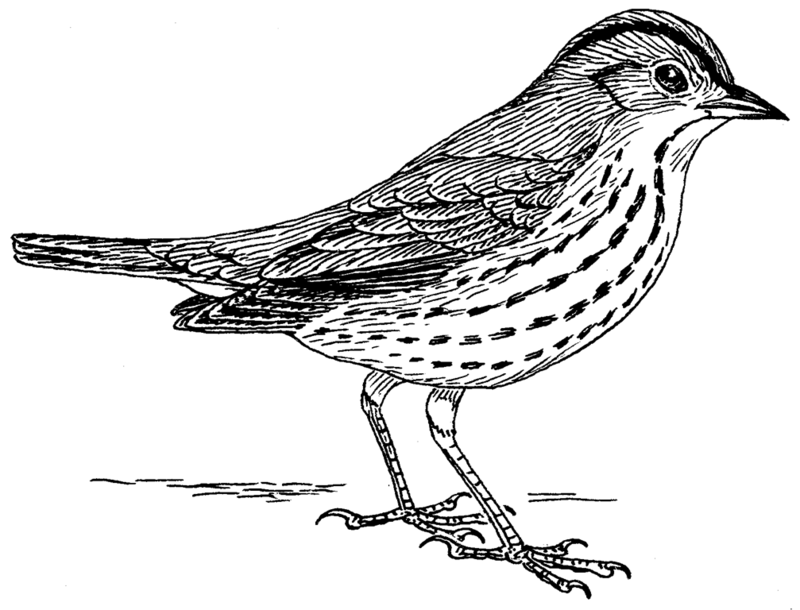 In “The Oven Bird” Frost draws our attention to a bird that sings on, past the promising days of spring, and whose song is none-the-less, loud and insistent, even though he’s singing in a season where he might well feel out of place and out of time for song. Then in the closing section we’re first told that the future holds the fall season—and by extension, both the fallen state of man and the death cycle of nature—and “the highway dust is over all.” Some have read that line as Frost noting the coming of the 20th Century roads that will close out even more forest and bring some measure of end to the natural world. I think instead the “highway dust” is more at a statement of the death of all living things (dust implies in my reading “to dust”) and that dust is the dust of a set, laid out, road. Finally, Frost hits us, and me specifically near 10 years ago, with his conclusion—one that says much for this project that seeks to find “The place where music and words meet.” He says those of us, also mid-summer and mid-wood who listen knowing these things, sharing the bird’s predicament, should know that the bird has these teachings to pass on to us, “He knows in singing not to sing” (a zen koan of a line) and that the present question is “what to make of a diminished thing.” What a progression to this, from the plainest language with simple words never more than three syllables long, singing us the oldest cycle known to self-conscious humans—and then Frost gives us a line suitable for meditative thought and a question. This is where I break from those who see this as a despairing poem about death, failure and decline. The poem asks what to make of that, offering the example to loudly sing.